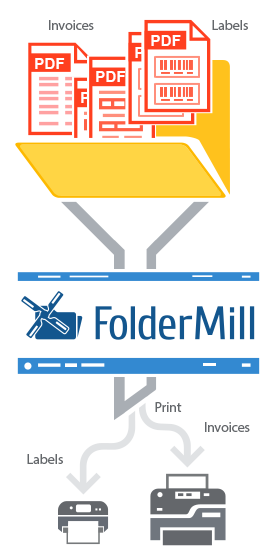 You can easily do it with FolderMill. Let’s say, we have label stickers in PDF format titled "Orders-2017-06-29-label.pdf", "Orders-2017-06-30-label.pdf", etc. which are to be printed on a barcode label printer. At the same time we have dispatch notes and invoices to be printed on another printer - Laser Printer - and on different printer trays (Tray 1 and Tray 2 accordingly). Label stickers and dispatch notes should be printed in grayscale mode, whereas invoices - in color. This will allow this action set process only files ending with "label.pdf", according to the mask. You’ve made processing rules for the label stickers. Now let’s add Actions for dispatch notes and invoices. Add "Filename Filter" and input *dispatch-note.pdf as a filename filter and click "OK". Thus, this Actions Set will allow FolderMill to pick only files ending with "dispatch-note.pdf" in their filenames. Add "Print Document" as a second Action. Select your laser printer and open printer Settings. Your own printer settings may vary, but there are normally options to select printer tray, color mode and other preferences. Select "Paper Source: Tray 1", "Black & White" and click "OK". In a similar way, create a third actions set for invoices and add "Filename filter" action again. Input *invoice.pdf as a filename filter and click "OK". Add "Print Document" as a second action. Open printer Settings to set Paper Source and Color Mode. Select "Paper Source: Tray 2" and "Color" and click "OK". If you have any questions or issues on features described here, please contact us.